Our Abpromise guarantee covers the use of ab9659 in the following tested applications. The ED50 determined by a cytotoxicity assay using HT-29 cells is ≤0.05 ng/mL, corresponding to a specific activity of ≥ 2 x 107 units/mg. Sterile filtered. Greater than 97% by SDS-PAGE and HPLC analyses. Centrifuge vial prior to opening. Reconstitute in 100 µl 1x PBS, pH 8.0 to a concentration of 1.0 mg/ml. Do not vortex. Long term storage: Follow reconstitution with further dilution in a buffer containing a carrier protein (example; 0.1% BSA). Store working aliquots at -20°C to -80°C. Avoid repeated freeze-thaw cycles. Produced by lymphocytes activated by specific antigens or mitogens. IFN-gamma, in addition to having antiviral activity, has important immunoregulatory functions. It is a potent activator of macrophages, it has antiproliferative effects on transformed cells and it can potentiate the antiviral and antitumor effects of the type I interferons. Released primarily from activated T lymphocytes. In Caucasians, genetic variation in IFNG is associated with the risk of aplastic anemia (AA) [MIM:609135]. AA is a rare disease in which the reduction of the circulating blood cells results from damage to the stem cell pool in bone marrow. In most patients, the stem cell lesion is caused by an autoimmune attack. T-lymphocytes, activated by an endogenous or exogenous, and most often unknown antigenic stimulus, secrete cytokines, including IFN-gamma, which would in turn be able to suppress hematopoiesis. Belongs to the type II (or gamma) interferon family. Proteolytic processing produces C-terminal heterogeneity, with proteins ending alternatively at Gly-150, Met-157 or Gly-161. The expression profile observed is consistent with what has been described in the literature (PMID: 17142784). 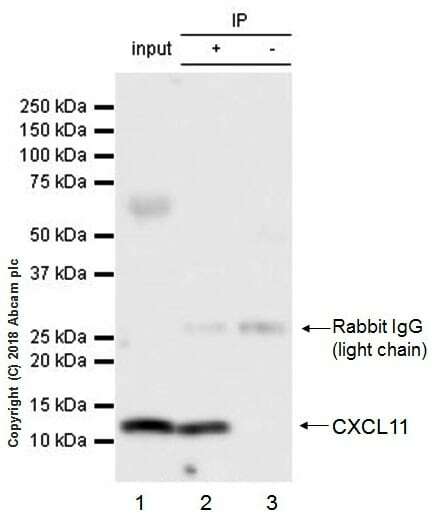 CXCL11 was immunoprecipitated from 0.35mg of THP-1 (human monocytic leukemia cell line) whole cell lysate with ab216157 at 1/30 dilution. Western blot was performed from the immunoprecipitate using ab216157 at 1/1000 dilution. VeriBlot for IP secondary antibody (HRP) (ab131366), was used as secondary antibody at 1/5000 dilution. Lane 1: THP-1 (human monocytic leukemia cell line) treated with 200 ng/ml interferon-gamma (IFN-gamma, ab9659) and 50 ng/ml lipopolysaccharide (LPS) for 24 hours, then added 300 ng/ml Brefeldin A (BFA) for 20 hours, whole cell lysate 10ug (Input). Lane 2: ab216157 IP in THP-1 treated with 200 ng/ml interferon-gamma (IFN-gamma, ab9659) and 50 ng/ml lipopolysaccharide (LPS) for 24 hours, then added 300 ng/ml Brefeldin A (BFA) for 20 hours, whole cell lysate. Lane 3: Rabbit monoclonal IgG (ab172730) instead of ab216157 in THP-1 treated with 200 ng/ml interferon-gamma (IFN-gamma, ab9659) and 50 ng/ml lipopolysaccharide (LPS) for 24 hours, then added 300 ng/ml Brefeldin A (BFA) for 20 hours, whole cell lysate. Observed band size: 12 kDa why is the actual band size different from the predicted? IP10 protein secretion can be induced by IFN-gamma treatment (PMID: 11907072). Publishing research using ab9659? Please let us know so that we can cite the reference in this datasheet. There are currently no Customer reviews or Questions for ab9659.